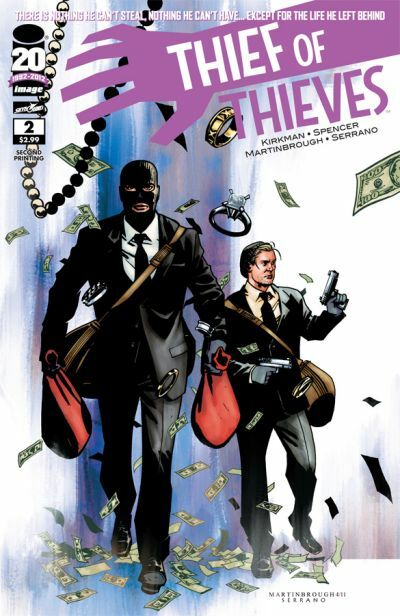 THIEF OF THIEVES #2, published by Image Comics, won’t be on comic book store shelves until Wednesday March 14, but it has already sold out at the distributor level. A second printing (DEC118235) will be in stores on April 11, the same day as THIEF OF THIEVES #3. On March 14, the second printing of THIEF OF THIEVES #1 will also be in comic book stores. Robert Kirkman’s newest comic book series, co-written by Nick Spencer and drawn by Shawn Martinbrough, is about a master thief who leaves behind his life in the high-stakes world of crime to try to return to being a family man. THIEF OF THIEVES is a full-color monthly comic published by Image Comics’ Skybound imprint, available in comic book stores and on multiple digital platforms.